I'm pretty excited about my newest download in honor of Cinco de Mayo. 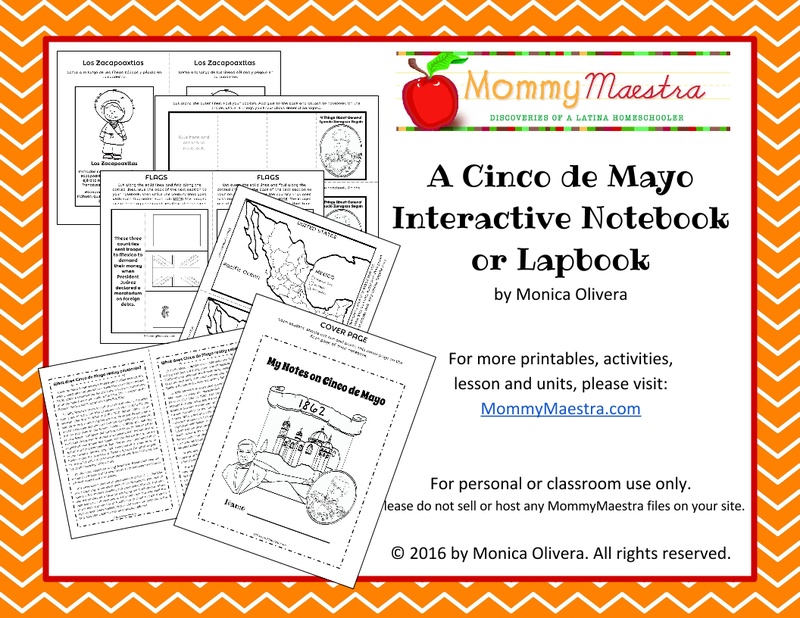 My newest activity is designed to be used with an interactive notebook or lapbook. 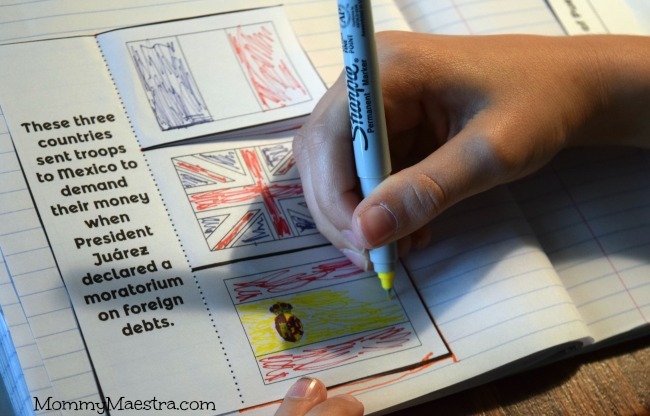 If you've been homeschooling for any time, you are no doubt familiar with lapbooks. If you are a new homeschooler, or a parent with children in a traditional school setting, then let me briefly explain both. Lapbooks are a popular way of learning. Children take a manilla file folder and usually fold it in such as way as to create two flaps that open like doors. Inside are educational bits that are visually appealing. You may have maps, pockets with flash cards, drawings, graphs, minibooks, flaps, and accordion books. Facts are broken up into manageable sections for kids to learn and organize. Interactive notebooks are similar, but instead of file folders, students use their notebooks. 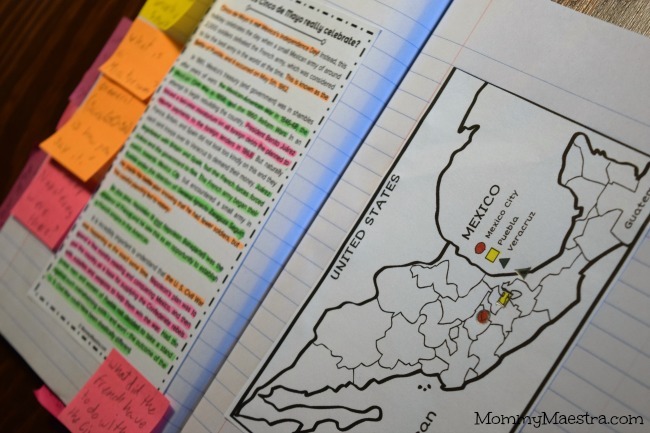 Inside, students paste reading passages and graphic organizers that they cut out, color in, write in, or otherwise assemble. 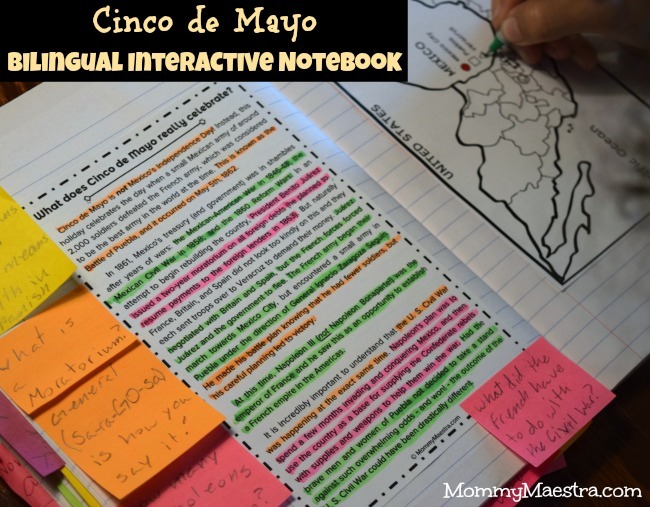 Because my kids really love their interactive history notebooks, I decided to create a set of instructional materials based on Cinco de Mayo. All of the ones I found on TpT, sadly focused on stereotypical images and concepts of sombreros or chips and salsa. Few actually tell the REAL and complete history of Cinco de Mayo and its impact on U. S. history. This packet comes with all materials available in English AND Spanish. It was designed for students in 4 - 8th grades. 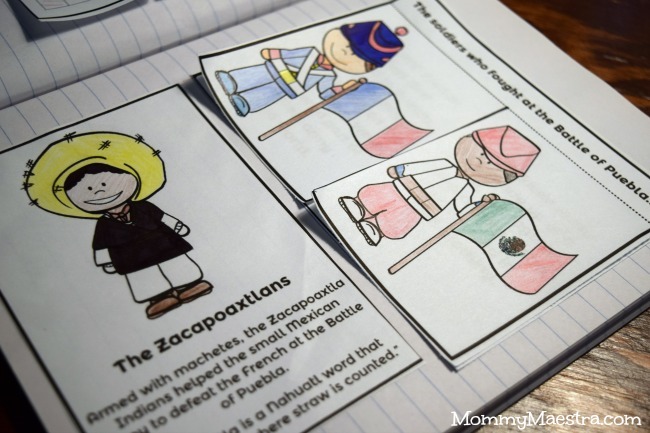 Here are some sample pictures of my kids adding this set of Cinco de Mayo printables to their history interactive notebooks. 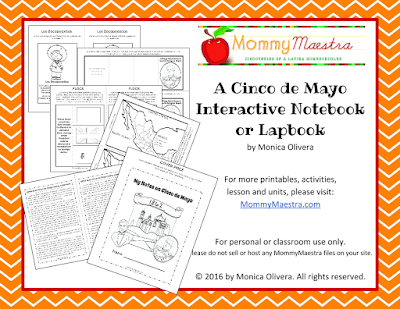 If you'd like to use my Cinco de Mayo Interactive Notebook or Lapbook with your own students or children, you can find it in the MommyMaestra Shop or in my TpT store.